Actor Priyanka Chopra unveiled imaging maker Nikon India's latest Coolpix collection for Spring Summer 2012 on Wednesday in Mumbai. The Coolpix Spring Summer series offers a simple way to capture photos and HD movies with ease. Coolpix P510 features 42x optical zoom covering 24mm wide angle through 1000mm super telephoto and a built-in GPS. "The Coolpix collection gets more happening and colourful every season. While design and colour are just added attributes, the series also makes photography fun and easy for a spontaneous photographer," says Priyanka. Further, from "go-anywhere" high-definition video recording to automatic capture of images, all 13 models come in different colours. Coolpix S-Series includes seven new models with built-in GPS function, an optical zoom ranging from 3x to 18x that utilises thin optics and a 10.1million pixel to 16.0-million pixel count for superior image quality. The Coolpix L-Series comprising of four models come with a wide-angle 22.5mm and super telephoto 585mm coverage. Nikon is going all out to capture the Indian market. Nikon aims to have a bigger slice in the compact camera market and maintain its leadership position in the digital single lens reflex (DSLR) category. 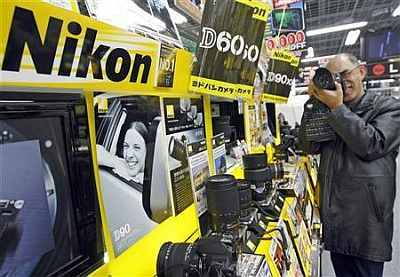 Owing to the tsunami that struck Japan last year, digital imaging major Nikon India's sales dipped nearly 20 per cent in FY12. The Japanese firm, which had earlier forecast sales of Rs 900 crore (Rs 9 billion) for FY12, clocked Rs 750 crore (Rs 7.5 billion) in revenues. However, the company is eyeing a growth of 60 per cent in sales to Rs 1,200 crore (Rs 12 billion) this fiscal, Nikon India managing director Hiroshi Takashina said. "Currently, India business contributes nearly 1.5 per cent of Nikon's global sales. But we think it is small considering the demand potential. We expect to make this to five per cent in the next three years," he said. Nikon India enjoys a 25 per cent market share in compact camera market, which is currently around 32 lakh units, up from 24 lakh units in FY11. "We expect the compact camera market to touch 40 lakh units by 2012-13. We have set a target of capturing a 30 per cent share in this growing market," he said. Meanwhile, Nikon plans to maintain its current 55 per cent share in DSLR market, which is expected to grow at 40-50 per cent year-on-year over the next five years. "New launches will help us maintain the leadership position in the segment," Takashina said. At present the company sells 18 models of compact camera in India and 10 models in the DSLR segment. "We plan to increase the number of D-SLR and Coolpix outlets from 93 to 110," he said. With additional inputs from PTI.